In SwimRay, we are different in our approach as we emphasis on Sports Sciences to plan our swim programs. Sports Psychology is complemented with Sports physiology and unique personalised coaching techniques to get the best of out of our students. Having been on the receiving end of not-so-desirable coaching when we were young, we have a passion to implement our expertise in Sports Sciences to have everyone learn swimming in a way which is best suited to their pace, character, and confidence (psychology) and motor coordination (physiology). Just like thumbprints, we believe that no two students can ever benefit fully from the same training plan. Every individual is different, and we plan different plans for different individuals. Our work with you does not stop at the pool. We take pride in our meticulous planning after and before sessions, to ensure every session is better than the last. Gone are the days where copy and paste routine classes occur! Swim with us! Young or adult, we welcome you to be part of our personalized swimming lessons! The older one gets, the more one can understand and comprehend the essential techniques needed to pick up swimming. With quantity practice on your own, adults have not had an issue picking up swimming with us in no time! Looking for something more different other than the 4 basic strokes? The only swimming course in Singapore that equips one with unique skills to survive in harsh distress conditions in deep water, such that one is able to continue swimming while waiting to be rescued, or even independently all the way back to shore. We teach you to ensure your safety in the sea and also to gain a steady improvement in your times and distances. Look no further than our fun workouts that take into account personal preferential workload, intensity, equipment. We implement games, science, and intensity to ensure one never has to face the problem of needing to motivate oneself to go for a workout! Try us out! Every individual picks up swimming at a different pace based on their towards sports and physical physiology. Be comfortable learning with us as we tailor lessons to one's learning ability. Patience is our forte. Lessons are structured in a way that one would never feel alone or threatened by the water. We are always within touching distance of our students and we take pride in our parents and students feeling safe and confident in our instructors. We have years of experience guiding absolute beginners of any age to skilled swimmers. Our motto of ensuring swimming is something for everyone always stays. Interested to know more about Private Swimming Lesson ? Find out more on Learn To Swim page! Check out SwimRay Special Programs ! 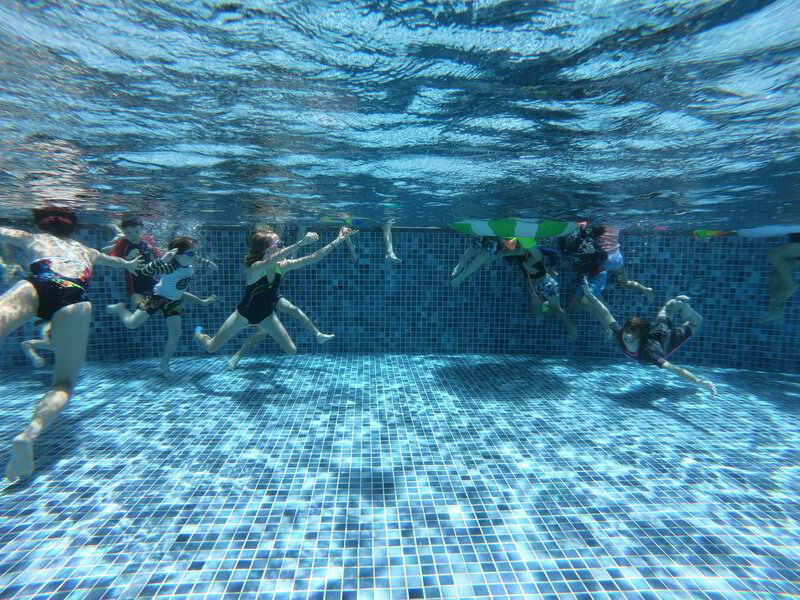 More than 25 public Swimming Pools in Singapore are built for good reasons! Don't miss out the benefits of swimming! Here are 6 reasons why you should swim! Swimming helps strengthen muscles around the joint without having too much impact. It’s an ideal exercise for seniors that suffer from joints pain. The buoyancy and resistance of water makes swimming an ideal low-impact exercise for physiotherapy and rehabilitation. Swimming regularly helps strengthen your cardiovascular health - as water resistance makes your circulation system work harder against it. Swimming relaxes your muscles and release stress - It provides soothing effect to the mind as how yoga and meditation do. Don't let the fear of water stop you from exploring all the water activities ! Equip yourself with the life skills that every adult and child should have! Swimming is a full body exercise requires major body muscles working together. It stimulates blood flow and increases metabolism rate - An hour of swimming burns up more than 600 calories. SwimRay gives you the personal attention you deserve. We personalize swimming lessons according to differing needs. It's never too young or too late to get in the water, feel confident, and have fun! More about our swimming lesson and coaching style.